I grew up in a rural community, so horses were not uncommon. One of my best friends owned a horse. His name was Ranger. Once in a while Maureen would let me take Ranger out for a ride. This was always fun, until Ranger figured out I had no idea what I was doing, and spent an hour walking around in circles that kept getting smaller and smaller, until finally he just stood still. That was the worst. The best was when Maureen was there and we took turns cantering across an open field of grass, or plodding along a windy trail. 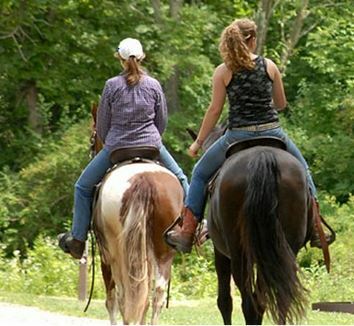 I always found horse-back riding an escape from reality (working on my family's farm was no picnic), as well as relaxing, and just plain old fun. Anyways, horseback riding nowadays is a different kettle of fish from 40 years ago. No one I know has a horse in their backyard, primarily because most of us live in the city and don't own enough land to keep a horse. Likewise most of the stables are in the Fraser Valley, but you can find a few tucked away closer to the city. If your kids are nuts about horses, check out these stables to see if any suit your family dynamics. If you find a good one, let me know, I'd like to try riding again one day. I just have to persuade my husband and kids that horses are nothing to be afraid of.